Oh. My. Gods. There are no words for how awesomeamazingextraordinary this book is. But, I will try to put its wonderfulness into words.At the end of Half-Blood (see my review HERE), Alex had her world turned upside down. Her mother turned into a daimon and was killed. She fell for a pureblood, and will become the new Apollyon, a half-blood with the power to control the elements, when she turns 18. Despite being in the confines of the Covenant, there have been multiple daimon attacks within and outside the Covenant. She also has to testify at the Council in New York, where there is a cryptic danger that seems to follow her around. To top it all off, she is torn between two boys, Aiden and Seth, who ignite her soul in different ways.Alex is just as badass in this book as she was in the first one. Nothing will stand in her way when she wants something or when she feels injustice. I love her so much! Underneath her tough exterior, she is a girl who is self-conscious about the marks she received from the daimon attacks. She is a complex character and one of my favorites ever!So now onto the guys…. sigh….. swoon….Okay, so Aiden stole my heart in Half-Blood. Now, although he cares and loves (even though he won’t admit it, dammit) Alex, he is hot and cold. Some days, his passion jumps off the page to the point where my heart bursts, and other days, he gives her the cold shoulder. I do understand where he’s coming from… he’s a pure, she’s a half. But at the end of the book, I couldn’t believe what he sacrificed for Alex! It pulled at my heart strings.Seth took my heart from Aiden and now he has possession of my heart. I completely fell for Seth. In Pure, we see a whole different side of Seth. He is still the stubborn, egotistical self he was before, but he comes to really care for Alex. His fierce protectiveness was so damn sweet.Clearly, I am a bit torn.The plot is fast-paced and unexpected, everything that I love in a book’s plot. The air of mysteriousness is the perfect amount. That ending left me wanting the next book immediately! And of course the romance was beyond lovely. I gotta have some more Seth and Aiden. ARG! I’m so dang torn, I need to read moreeeeeee.I inhaled this book in literally less than a day, so you know its gotta be amazing. 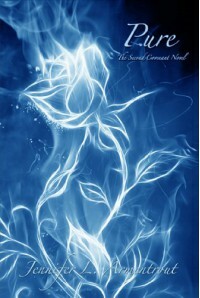 If you haven’t started this series yet, go seriously and pick up Half-Blood. Now. Seriously. You haven’t lived yet.In light of the incredible love triangle, y'all deserve two swoon-worthy quotes.Favorite Seth Swoon-worthy Quote: I looped my arms around his neck, tangling my fingers in his hair, and then I was kissing him back. Kissing him with the same wild abandonment he’d dived into, and gods, I liked kissing Seth. He was really good at it. Seth nipped at my lower lip as he pulled back just enough that I could breathe. “You can’t tell me what you didn’t like that.” He pressed his lips to mine again, soaking up my response. “And don’t you dare tell me you didn’t kiss me.”Favorite Aiden Swoon-worthy Quote: This kiss was nothing like the first one we’d shared. Its rawness left us both breathless. There wasn’t a moment of hesitation or indecision. There was just want and need and a thousand other powerful, crazy things. His lips scorched mine, his hands dropping to my shoulders, sliding down my arms. My skin burned under the sweater, but oh, this was so much more than just a kiss. It was the way he touched the deepest parts of me. 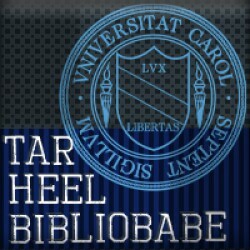 My heart and soul would never be the same.Rating: 5/5 Tar Heels!See more reviews at www.tarheelbibliobabe.blogspot.com!